- Publisher For anyone who loves to laugh or needs to laugh, this is the perfect book! With hundreds of humorous illustrations arranged alphabetically by topic, this little pocket-sized book is a great collection to sit and read to friends and family or to just sit at your desk and read for a quick pick-me-up! - Publisher Nelson's best of the best-sellers in a smaller version. Hundreds of laughs from A to Z(R). Jokes, stories, and one liners for all occasions. Nelson's Little Book of Laughter is completely illustrated, compact, easy-to-read great for gift and part of the Nelson's Little Book Series. 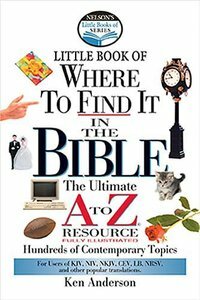 About "Little Book of Where to Find It in the Bible"
For anyone who loves to laugh or needs to laugh, this is the perfect book! With hundreds of humorous illustrations arranged alphabetically by topic, this little pocket-sized book is a great collection to sit and read to friends and family or to just sit at your desk and read for a quick pick-me-up! Nelson's best of the best-sellers in a smaller version. Hundreds of laughs from A to Z(R). Jokes, stories, and one liners for all occasions. Nelson's Little Book of Laughter is completely illustrated, compact, easy-to-read great for gift and part of the Nelson's Little Book Series.